The power management control ECU receives vehicle speed information using 2 methods. It receives a speed signal from the meter ECU. It also receives speed information from the meter ECU via CAN. If the information sent using these 2 methods is inconsistent, this DTC will be stored. 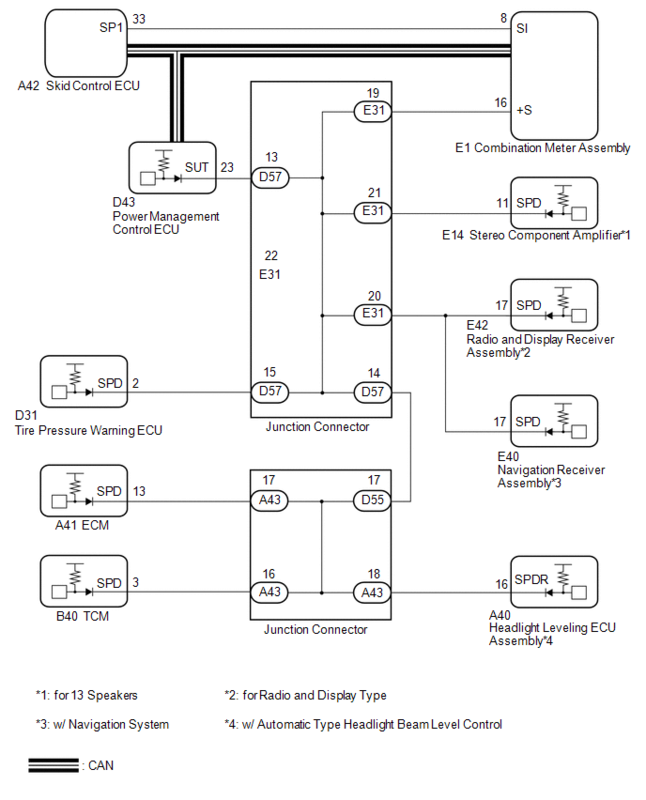 Speed information received by the power management control ECU via direct line and via CAN is inconsistent. 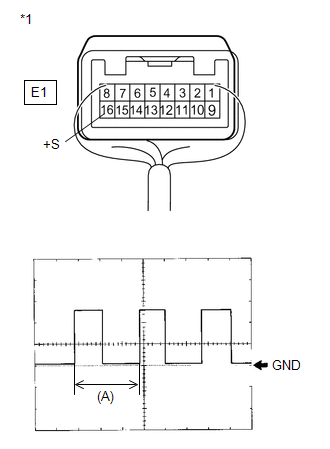 A voltage of 12 V or 5 V is output from each ECU and then input to the combination meter. The signal is changed to a pulse signal at the transistor in the combination meter. Each ECU controls the respective system based on the pulse signal. If a short occurs in an ECU, all systems in the diagram above will not operate normally. (a) Check if CAN communication DTCs are output. 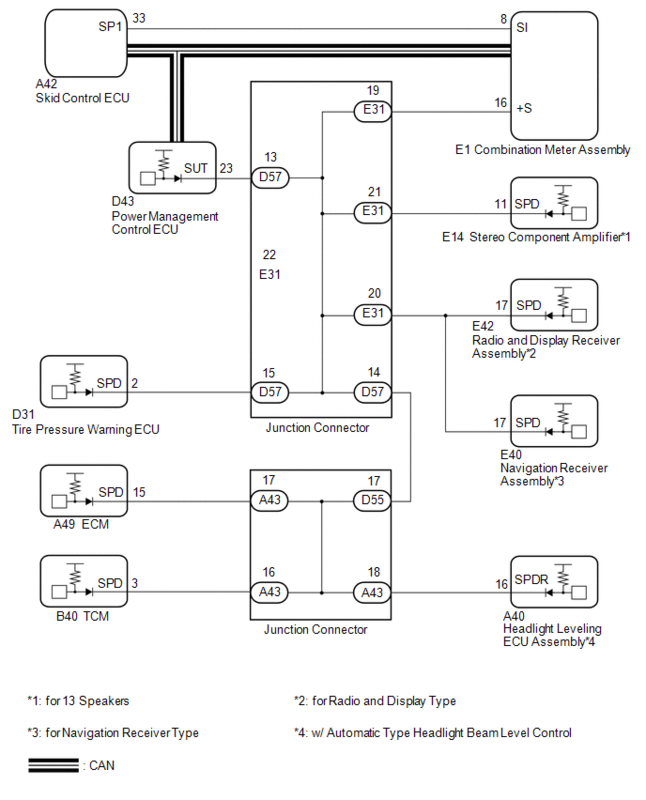 If any DTCs for CAN communication system malfunction are output, inspect those DTCs first. (e) Check the Data List for proper functioning of the vehicle speed signal. Vehicle speed displayed on the Techstream is almost the same as the actual vehicle speed measured using a speedometer tester (calibrated chassis dynamometer). Stop (vehicle is stopped) and Run (vehicle is running) appear on the screen. (a) Disconnect the E1 connector from the combination meter assembly. (a) Remove the combination meter (See page ). (b) Reconnect the E1 connector to the combination meter assembly. (c) Reconnect the D43 connector to the power management control ECU. (d) Connect an oscilloscope to terminal E1-16 (+S) and body ground. (e) Turn the engine switch on (IG). (f) Turn the wheel slowly. (g) Check the signal waveform according to the condition(s) in the table below. 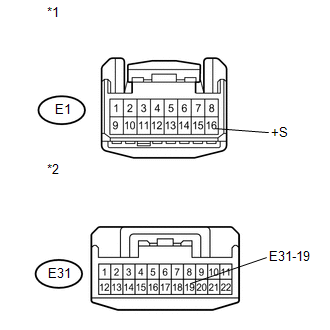 (a) Disconnect the E31 connector from the junction connector. (a) Disconnect the D57 connector from the junction connector.